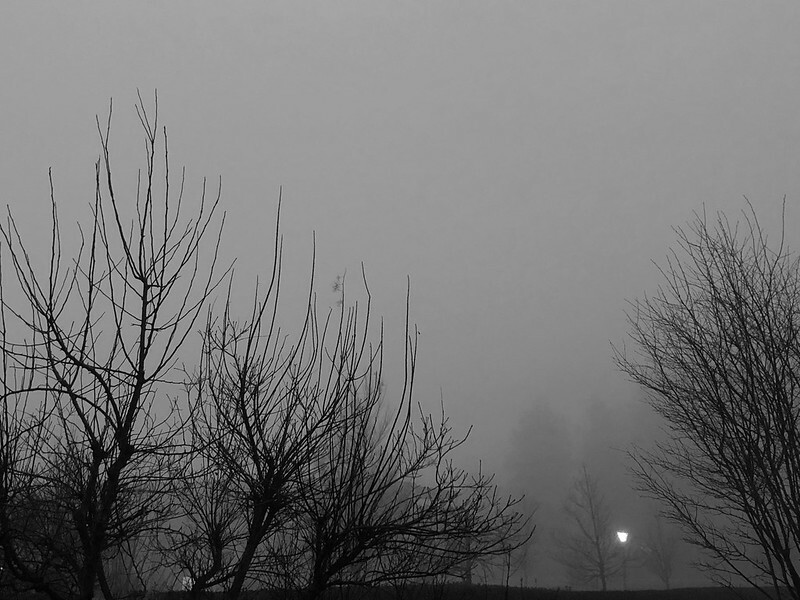 This morning was a very misty morning. Due to having a river running through it at the bottom of the path and the cold temperatures, we have mornings like this. I actually had to convert my photo to black and white, which is more realistic as my telephone camera had a blue sky on the photo. The mist will probably be gone in a couple of hours when we depart for the shopping tour. 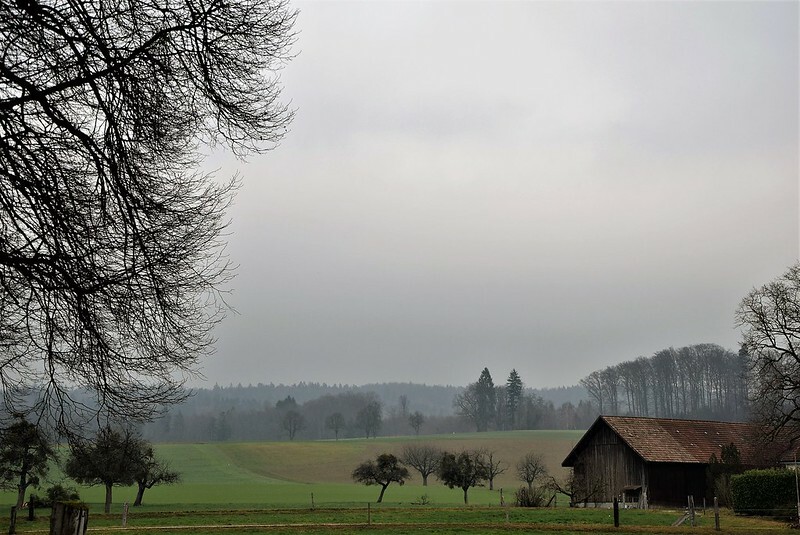 Yeserday afternoon on my “walk” through the top part of the village, known as St. Niklaus, up to the local castle I also noticed there was a faint mist over everything. I had the paths almost to myself and decided to try the route from the castle to the village church. It was a downhill run part of the way, but my trusty steed, the wheelchair, managed it easily. Most villages seem to have their churches perched on a hill looking over everything. I must admit I have never actually been inside this church. 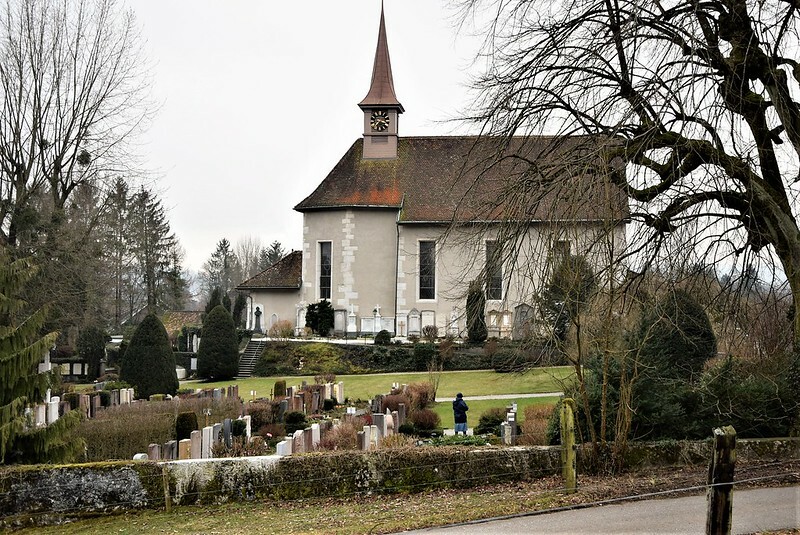 It is Roman Catholic, as most village churches in our area, although there are also Swiss reform churches for the others as would be Mr. Swiss. I was christened Church of England, so that is somewhere between the two of them, but more in the catholic direction. We got married in the registry office is Switzerland to simplify matters. It was a quick ordeal, in a language that I did not really understand so well at the time, but I got a Swiss passport into the bargain afterwards. Today you no longer get the Swiss passport automatically but have to wait a couple of years to see if you stay or not. Today I have dual nationality, but my british passport is no longer valid, and I no longer really need it. My last journey to England was my father’s funeral and I no longer visit such far away places that incorporate a plane journey. I travelled on and came to a fork in the country roads. 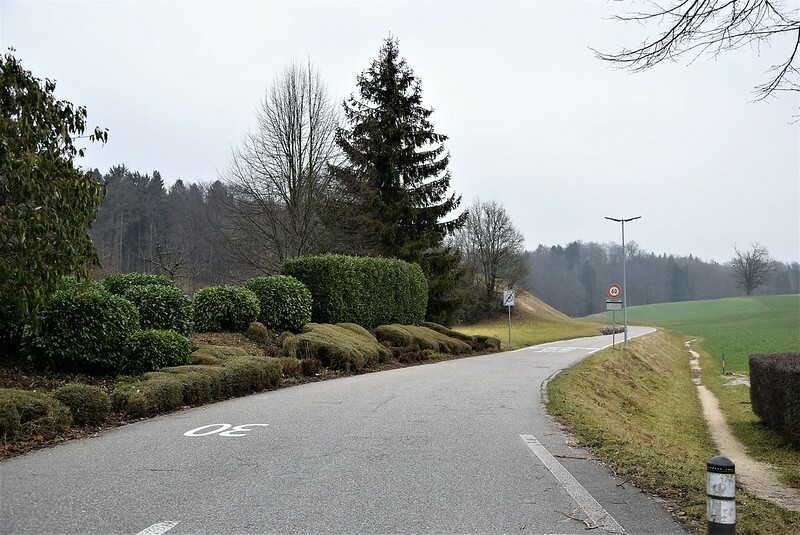 On the right it branched off to the next village of Riedholz which is not far. Perhaps I might extend my trip one day, although this is a road with traffic and no sidewalks, so it could be a little precarious. I am becoming very daring in my wheelchair. At 10 kilometers and hour I would reach Riedholz in a matter of minutes. 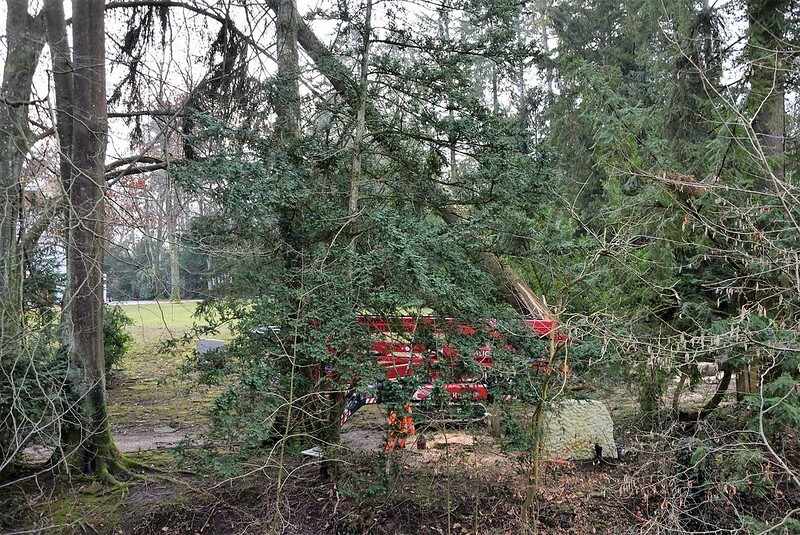 On the return journey home I cut through the cemetery and noticed that the forest workers were still busy clearing away the remainders of the big storm last week. There were still smaller branches on the paths and this tree seemed to break under the force of the wind. There were a few machines standing around doing the removal work. One guy on a tractor was blocking my path, but when he saw me coming he moved out of the way. In the meanwhile there are still Swiss villages in the Kanton of Valais cut off from the world, due to avalanches and snow like Zermatt. The latest news is that Mr. Trump has decided to attend the WEF (World Economic Forum) meeting in Davos, Switzerland, later this year. I hope he will understand what it is all about and that he keeps his big mouth shut. I am sure he is only coming to check on his Swiss bank accounts, or perhaps there are golfing courses in Davos. Our presdent, Alain Berset, wants to meet him for some strange reason. And now to move on, there are logistics to be organised for today’s shopping and an appartment to be hoovered and mopped. Stay safe, have a good day and make the most of it. 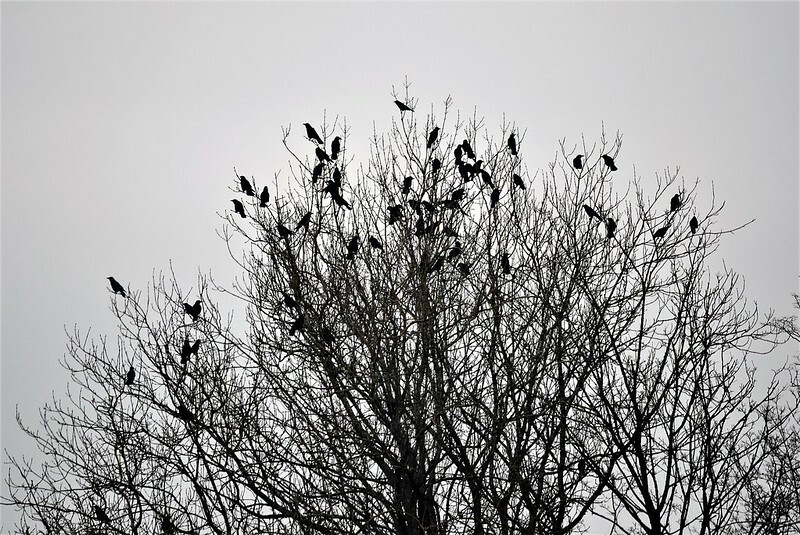 The crows are gathering in our part of the world to keep an eye of things. I saw them as I was on the home run yesterday in the tree. I even made a stop and changed my camera lens to zoom in as they were on the other side of the main road. Right at midnight. It must be time for me to retire for the night. I am sorry about Mr. Trump. Sadly, he tends to offend. He will be arriving already at the end of January. it seems that the Swiss people are not exactly putting out the welcome carpet. Is it a murder of crows? I ‘ve always liked that expression. Please let me add my apology for your gorgeous country to have the orange baboon visiting. He is an embarrassment to the people of the United States who actually use the brains they received at birth, and we are saddened and embarrassed when he even opens his moth, much less visits another country. Gorgeous pictures by the way. I wish my camera took pictures as nice as you phone does. No-one really invited Trump, it’s away of worming himself in, although it will be fun to hear his „wise“ words at the conference. The Swiss already see problems with his security. There are enough problems at the WEF conference every year with demonstrations and riots. These photos were all taken with my Nikon DSLR camera on my way in the wheelchair. Only the first was with the telephone. You take such beautiful photos! I sure wish Trump would keep his mouth shut, but it doesn’t seem like he has it in him, and as a US citizen I am in a constant state of befuddlement and frustration these days! And the man is convinced he has a super intelligence. At least we have something to laugh at. I love the picture of the barn and green field, Pat. Beautifully composed! Thanks, It was a bit misty in the afternoon, but all the better to set the mood. I am so glad I can now get out again and take photos.